If you have an idea in mind and can't seem to find it anywhere, drop me an email to discuss it. I am always happy to talk whips and will let you know if I am up to the challenge or not. Prices will vary depending on what you ask me to do. This is the Bodlak whip™. Named after the man who dreamed it up. This is by far the hardest whip I have ever made and it is also one of the coolest. I'm surprised how well this design performs. It is a new kind of animal though. If you order one of these you'll have to forget everything you know about how whips handle! I am willing to make more upon request. Because of the extra time in the fabricating shop bending metal and the crazy rigging it takes to plait it, the price is $200 + shipping. 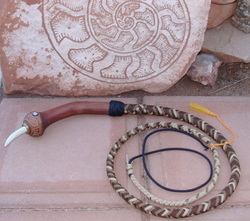 For more information please look at the Blog I wrote on this whip. 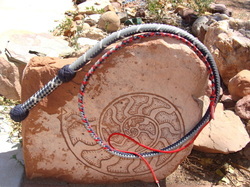 As you may be able to guess, this is another whip created for Mr. Bodlak. 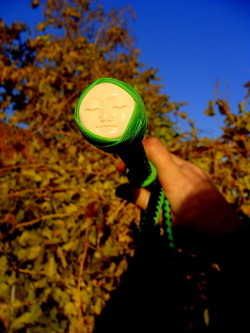 It has a custom handle that he made himself and then I attached it to a whip. 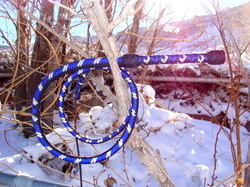 This beautiful blue whip is a good example of specialty paracord. 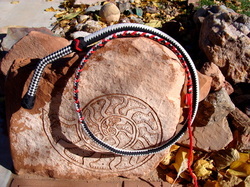 This whip has Flash paracord that reflects light and makes the whip appear to light up. I also have tracer paracord that is the same idea as flash paracord but is more noticeable because the tracer is usually a dark grey. Both reflect light and it is a matter of personal taste on which one you like. I have Glow in the dark paracord in green, blue, pink, yellow and white. All are very pastel colors. The glow does come plain or with light reflecting tracer. How cool is that?? If you find a color of paracord somewhere that I don't have listed, let me know and I can get it for you. The prices on the specialty paracord are a bit higher so the price of the whip will go up slightly to reflect that. Custom and one of a kind end knobs. 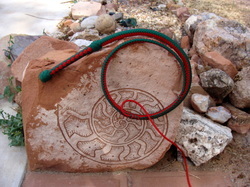 I always put a nice gem stone on the whips I make and I just go with my artistic eye when it comes to what looks good. From time to time I have clients who have there own stone or something picked out that they want to use instead. I love this idea because it makes the whip all the more personal to the client and does insure that it will be a one of a kind whip. I have put necklaces, antique buttons, stones and bone in the handles so far. The picture to the left is a carved camel bone. If you send me your handle end I will not charge extra. If I purchase it for you the price is added into the whip. Make sure that the end you pick out is at least 20mm and no more than 24mm. If it is too small or too big I can't make it work. So, to give you a visual... the size of a nickle is perfect and the size of a quarter is ok but getting too big. Here is another cool whip end. This one was made by a client who creates amazing things with blown glass. It took some figuring out how to attach it, but I am really pleased with the result. This is a whip built for children ages 2 to 8. It is not a toy and is not and adult sized 4 foot whip. The idea is a real whip that is balanced for a tiny person. If you have a special kid in your life who would like to start cracking, I offer these for $50 with the order of a full sized whip. I'm putting my combat bulls on this page too because they take so much extra work and the colors will be customized to your needs. The Combat Bulls are hard working whips designed with men in mind. I have made them a bit heavier and with more girth but they are still fast and responsive. Combat bulls are 16 plait with 2 bellies, 2 bolsters and a heavy shot load. Standard lengths are 4 1/2 and 5 foot. Email me if you want a different length. The handle is 7/8 diameter and the knots are built up slightly. This happens to be one of my favorite whips to use. Girls, don't shy away because of the size. Combat Bull - $190 Same price for 4 /1/2 and 5 foot lengths. The second color is always fee because I think everyone should have a beautiful whip. $15 extra for each additional color.after that. It is amazing that Bobbi Holyoak has created a nylon whip that reacts and moves like the high quality kangaroo whips I use. When working with either Bobbi's nylon Combat Bull or my kangaroo whips, it is very difficult to tell the difference. The nylon Combat Bull is very responsive. It is fluid and you feel very connected with the whip's movements. It feels as if you have a kangaroo whip in your hand, but it is nylon. Its exceptionally quick and accurate. The craftwomanship of the whip is excellent!. If you have a cool idea for a custom whip please let me know.